Sound effects are the sounds Lara makes, like her footsteps, grunts, gunfire, etc. But also all other sounds an animating object, like a trapblade, or baddies make. These so-called soundsamples are located in the TRLE/Sound/Samples folder. The game can crash if the format is wrong! A soundeffect is activated by assigning the sound to the wad AND the object. When you add a new object with sound to your wad using WADMerger the sound will usually automatically be added to your wad. If this does not happen or if you have been creating your own objects you need to manually add the sound to the wad. To do so you need to edit the Sound.txt. The sound.txt contains all sounds used by the LE and it is located in the TRLE/Sound/LevelSFX Creator folder. I've coloured the text on the screenshot to make the columns I'm describing below more visible. First column (LARA_FIRE) is a description of the sound. This can be changed as you see fit. 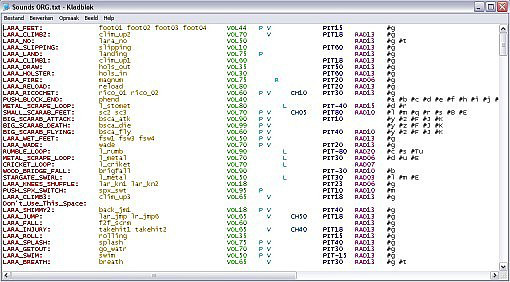 Second column (magnum) contains the name(s) of the associated samples. You can simply assign a new sound to an object by changing the name of the sample in this column. Third column (VOL75) indicates the volume of the sound. The higher the number, the louder the sound will be ingame. If the VOL is not set you won't be able to hear the sound ingame. - V Seems to stand for Varied : A sound with V will have a random slight pitch change each time it is played. If you carefully listen to the shotgun sound ingame you will notice that not every shot sounds the same: the LARA_SHOTGUN line has V assigned to it. If V is not assigned to a sample it will sound the same every time. - L Stands for looping . This needs to be assigned if you want a sample to play over and over again (=loop) The WATERFALL_LOOP line has an L assigned to it. The fifth column can contain the letters CH followed by a two digit number. - CH is the chance of the sound to be played when triggered. The smaller the CH number the less it will be played. If no CH is included in this column the sound will play every time it is triggered. CH is assigned to Lara's climbing grunt: you don't hear it all the time when she is climbing. Sixth column contains the PIT of the sound, which stands for pitch. PIT followed by a positive number raises the pitch, PIT followed by a negative number lowers the pitch. Leave the PIT out and no pitch change will occur. Seventh column contains the RAD values. RAD stand for radius/range . This value determines from how far away the sound can still be heard. The higher the number the further away the sound can still be heard. The rollingball and spikes for example have a RAD of 26, which makes them heard from very far away. Normal sounds have RAD06. The eight and last column contains a series of letters preceded by a #. These letters are associated with wads. The letters are case sensitive, so a is not the same as A. Once you have edited the sound.txt you need to convert it into new .sfx and .sam files. If you are running the LE on XP and if you are using one of the letters listed above you can do this by simply double clicking the SFX_Example.bat in the TRLE/Sound/LevelSFX Creator folder. The new files will automatically be placed in the Wads folder. If you are using a custom letter sequence (eg I'm using hm for my levels) you need to use the DOS Prompt to convert the sound.txt file. The manual says: From the LevelSFX Creator directory type the following DOS command: pcwadsfx settomb c. Of course, use the WAD (along with its associated letter) you wish to change. Settomb being the name of your wad, c being the letter or letter combination associated with your wad. Once converted you need to put the new files into the Wads folder. Convert the tom file of your wad and if all has been done correctly you will hear the changes you have made!